This competition is now concluded. Please stay tuned for the results! 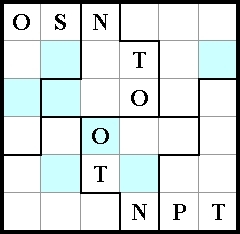 Due to the overwhelming popularity of last month's "Wordoku", this month will feature yet another variation of the same puzzle. Once again for those just joining us: In Wordoku, puzzle solvers use letters instead of numbers to complete a Sudoku-like grid. 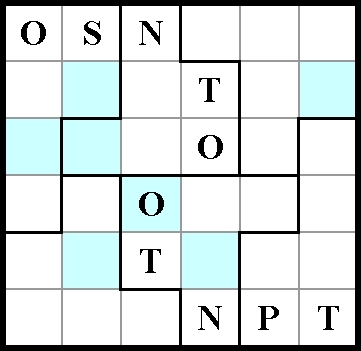 Upon completion of the puzzle, the shaded cells, when read from left to right, top to bottom, will read out the name of a common English word. Full details provided below! * 100,000 gold for all other correct entries. Instructions: "Fill in the grid so that every row, every column, and every six-square subsection contain all of the letters I, N, O, P, S and T. When you are done, the shaded cells, when read from top to bottom, left to right, will spell out a common MUDing word that is referred to by one of the articles in this month's edition of Gaardian. This one shouldn't keep you guessing for too long!" There is only one solution to each puzzle. For more information on the original puzzle, visit http://www.sudoku.com/.